What Is The Difference Between Curcumin And Turmeric? What Are The Side Effects Of Turmeric/Curcumin? Turmeric has been used as an ingredient for cooking for literally thousands of years. If you are a lover of Indian cuisine you may already know that turmeric is what adds the distinct flavour and yellow colour to certain curries. In India they have known for a long time that turmeric or one of its compounds “curcumin” has many benefits for the human body. In more recent times this has been confirmed with modern science and curcumin supplements are now taken by many people in the UK on a daily basis. That been said we also understand that many people are still confused about the topic of turmeric and curcumin. This is why we have put together our ultimate guide on the subject of choosing the best curcumin supplement. By the end of our guide you should have a clearer understanding on the subject and be better informed for when choosing the one that best suits your requirements. First of all let’s start with the basics. Turmeric is a small bushy plant and is a member of the zingiberacae plant family, it is officially known as curcuma longa in botanical circles. It grows in climates that have an ideal combination of warm temperatures and plenty of rainfall with Asia been the main source. The most popular part of the plant are the roots which are the main reason for the plants cultivation. The roots can be eaten raw or cooked, however, they are mostly dried and ground down into powder or used to produce turmeric oil. Curcumin is a bright yellow chemical produced by certain plants, chemically speaking it is known as a natural phenol. Phenols are produced by plants in the response to pressures in their environment, this could be to ward off insects, protect from UV radiation or even pathogens. Consequently the properties of phenols hold many health benefits for humans and are the subject of much research. Recognized as an antioxidant curcumin is used in many beauty products, especially anti-aging products. In ayurvedic medicine it is used as an anti-inflammatory and there are even scientists researching its potential as a cancer treatment. Now that you know what turmeric and curcumin are its time to clear up some of the confusion between the two. Curcumin is the main bioactive ingredient within turmeric and is the reason why turmeric has the health benefits that it does. Curcumin is without doubt the most beneficial component of turmeric and surprisingly it only amounts to between 2-5% of the turmeric rhizomes (roots). With the rest been mainly composed of carbohydrates (70%) a little protein and a healthy mix of vitamins, minerals and oils. To summarise the difference between turmeric and curcumin is that curcumin is an active ingredient of turmeric. If you are only thinking about buying curcumin supplements there are a number of health benefits that might help convince you that it is a wise decision to do so. Scientific research shows that inflamation is a contributing factor in most chronic diseases, especially in Western society. That been said, inflamation does have its benefits as it helps the body to fight harmful pathogens that could potentially kill you. The problem with inflammation is when it becomes chronic and attacks the body. As you might of guessed anything that can reduce chronic inflammation is also beneficial in combating and even treating some diseases. Curcumin is an anti inflammatory and it packs quite a punch with it been just as effective as some anti inflammatory drugs. Oxidation is a process believed to be a contributive factor in the production of free radicals in the human body. Free radicals help to speed up the aging process and are associated with many serious illnesses including cancer, Parkinson’s disease and Alzheimer’s to name a few. Free radicals are highly reactive molecules and cause serious damage to fatty acids, proteins and even DNA. With heart disease been the number one cause of death in the world, we should all be seeking ways to reduce the chances of getting it. Both oxidisation and inflammation play a significant role in the formation heart disease. We have already mentioned that curcumin reduces oxidisation and inflammation, but it also seems to help improve the function of endothelium. Endothelium more commonly known as the lining that coats your blood vessels plays a major role in helping the body regulate blood pressure and blood clotting. Studies suggest that curcumin can significantly improve endothelial function and reduce the chances of heart disease. 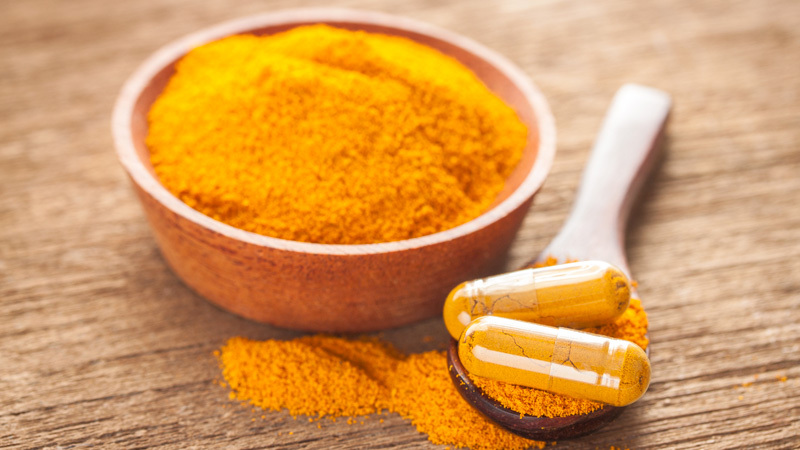 Everybody talks about the benefits of Turmeric, but when buying any supplement it’s wise to be aware of any potential risks or side effects associated with taking them. Curcumin supplements on the whole are considered very safe to use for the large majority of people. The main danger with turmeric/curcumin is for those that are taking blood-thinning medication. Turmeric has natural blood-thinning properties if you are taking blood-thinning medication seek medical advice before using turmeric supplements. Fresh turmeric isn’t as ready available as you might think and depending on where you live it can be quite hard to get hold of. If you live in a town or city where there are plenty of Asian fresh food shops then you have a good chance of getting your hands on some fresh turmeric. Once you have your fresh turmeric there are a number of things that you can do with it. If you are good in the kitchen you may want to look up a list of recipes and there are lots of them. If you like smoothies or use a cold press juiceryou can add it as a healthy ingredient. The only downside to fresh turmeric is when it comes to dosage. If you are consuming it for the health benefits or to treat an ailment, it is very hard if not impossible to know how much of the good stuff you are getting. This is why many people choose curcumin supplements as it is far easier to know the exact dosage. In its powder form turmeric is available to pretty much anyone. Turmeric powder can be bought in many shops and if your local store doesn’t sell it you can easily buy it online. The main benefit of turmeric powder is its long shelf life and convenience. The main use of turmeric powder is for cooking and just like with fresh turmeric it is hard to know exactly how much curcumin you are actually getting. Turmeric oil has benefits for the body when injested and when used externally. Due to this It is used in many toiletries and beauty products as a natural ingredient. Some of the conditions turmeric oil can help with are inflammation, treating sunburn, cracked heels to name a few. If you are seeking a convenient way to accurately receive a healthy dose of turmeric curcumin then taking supplements is highly recommended. 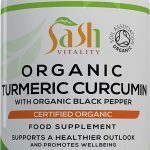 The benefits of turmeric curcumin in a supplement form are that you know exactly how much of both turmeric and curcumin you are actually getting making it far easier to be certain that you are taking a sufficient amount to reap the health benefits. Furthermore the best supplements on the market effectively deal with the issue of the bioavailability of turmeric and curcumin. This is done with the addition of other natural ingredients such as bioperine/piperine which is known to help with digestion. 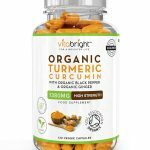 There are a good number of turmeric supplement brands to choose from making finding the right one for you a bit of a challenge. With that in mind we have put together our list of the top 5 supplements available to buy online. Hopefully, this will save you the time consuming task of going through all the different choices available and help you to find one that is suiable for your needs. Nu U Nutrition are based in the UK and they provide a wide variety of health supplements. 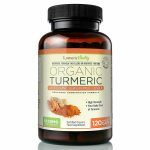 Their organic turmeric curcumin is one of their best selling products, which is no surprise as it comes with everything you would expect a top quality turmeric supplement to have. First of all there are a very impressive 365 curcumin capsules per bottle. This is great value for money as one bottle will last a whole year. In addition each capsule contains 600 mg of turmeric which is among the highest you will find. For bioavailability there are 5 mg of organic black pepper in each capsule. If you are looking for the best curcumin capsules look no further. 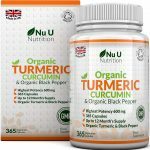 Nu U Nutrition Turmeric Curcumin Supplements offer a great mix of affordability and quality. With 365 capsules per bottle, a high amount of turmeric and all organic ingredients, what more could you ask for? ✔ MAXIMUM POTENCY & VEGETARIAN & VEGANS - Our Organic Turmeric 600mg supplement is twice the strength of many competitors. Many competitors advertise a high dosage but that is for 2 capsules - Nu U Nutrition offers 600 mg of Organic high strength Turmeric Curcumin from just one capsule. Also suitable for vegetarians and vegans. Sash Vitality are a family run business based in the UK and they only use 100% organic ingredients in their supplements. Furthermore they are certfied by the Soil Association and their Organic Turmeric and Curcumin capsules come recommended as Amazon’s choice. Each capsule contains 500mg of turmeric and 10 mg of organic black pepper extract (piperine). There are 120 capsules per bottle with the recommended dose been 3 capsules per day. No artificial ingredients or additives have been used in their production and they are 100% safe for vegans and vegetarians. In addition they are also Gluten free. 100% SOIL ASSOCIATION CERTIFIED ORGANIC TABLETS - Over 55,000 Turmeric bottles sold and still going - the UK's Premium manufacturer! Our product is uniquely 100% organic as we only use Organic Turmeric (600mg) and Organic Piperine (10mg - Black Pepper). Optimum high strength 600mg Organic Turmeric per capsule (1800mg per serving of 3 capsules). 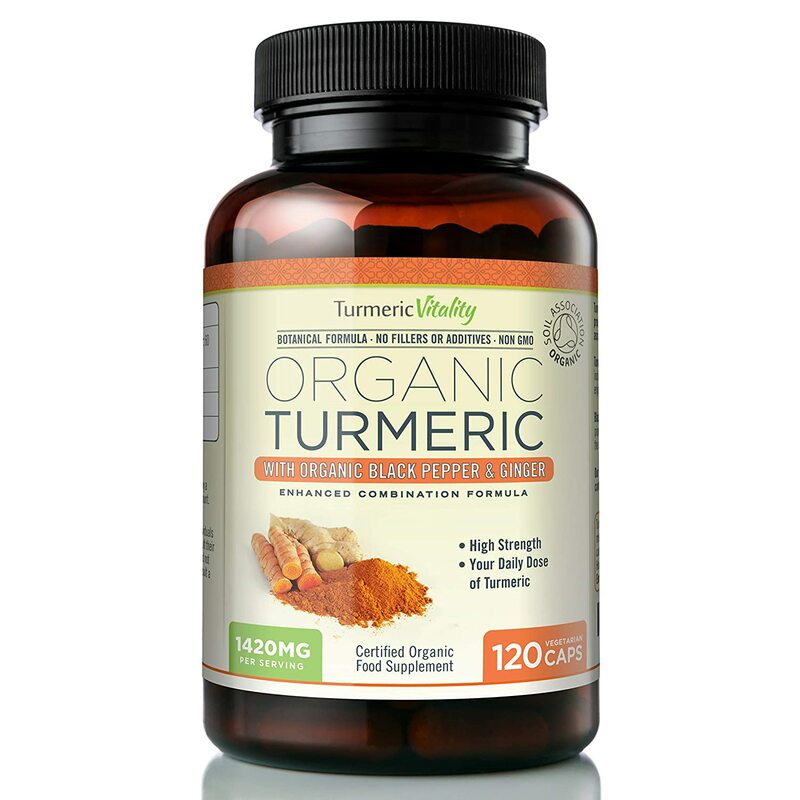 Turmeric Vitality are the number 1 choice for many people that take turmeric supplements on a regular basis. Their product differs slightly from the previous two in our curcumin supplement reviews as they feature the addition of ginger. Ginger helps to aid digestion and has many health benefits of its own. Like the rest of the ingredients the ginger is 100% organic. Another slight difference is the use of whole turmeic as opposed to turmeric extract. Each capsule contains 650 mg of turmeric which is very impressive. There is also 50 mg of ginger and 10 mg of black pepper. The capsules are made from organic vegetables making them suitable for vegans and vegetarians. With a high dose of curcumin its easy to see why Turmeric Vitality Turmeric Curcumin supplements are so popular. Reasonably priced and made from the best ingredients they come highly recommended. 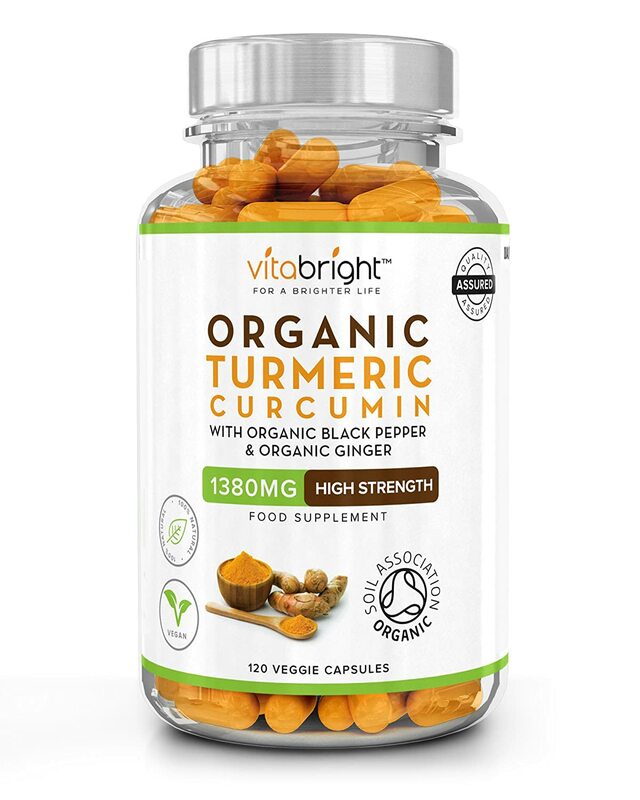 This curcumin supplement by Vitabright is another high quality supplement from a UK brand with a good reputation. Like all the best supplement brands every ingredient is certified organic by the soil association and there are no fillers, binders or GMO used in their production. Each bottle comes with 60 capsules that contain 630mg of organic turmeric. The recommended dose is 2 capsules per day meaning a bottle will only last 1 month. That been said they are made to the highest standard and are very reasonably priced. Another positive is the 100% money-back guarantee for anyone who isn’t totally satisfied with this product. ✔ HIGH POTENCY & PREMIUM QUALITY INGREDIENTS: Not only is our Turmeric Curcumin Supplement of the highest quality, all of our ingredients are Certified Organic with each dose containing 1260mg of Turmeric Curcumin. We never use any binders or fillers. 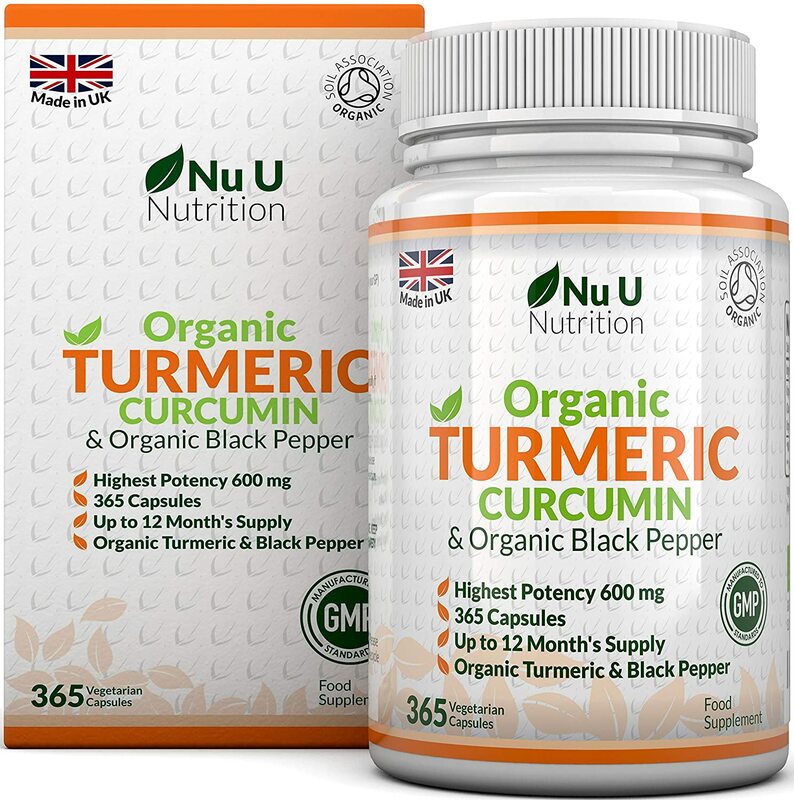 Nutravita are another UK based company that produce high-purity turmeric/curcumin supplements. Like all of the best supplement brands they meet all of the strict quality standards for a healthy and safe supplement. All of the ingredients used are certified organic this includes both the turmeric and black pepper. The recommended dose is one capsule per day and this will provide 600mg of turmeric (12mg curcumin) and 5mg of black pepper. Each bottle contains 120 capsules providing a 6 month supply. In addition to being organic and pure, our turmeric supplement is wheat free, gelatin free, lactose free, gluten free, free from binders & fillers, and is Vegan & Vegetarian friendly. Nutravita Turmeric is very popular and it receives excellent feedback from previous buyers. If you are looking fior a high-quality supplement at a very good price then you have to consider this brand as your potential supplier. 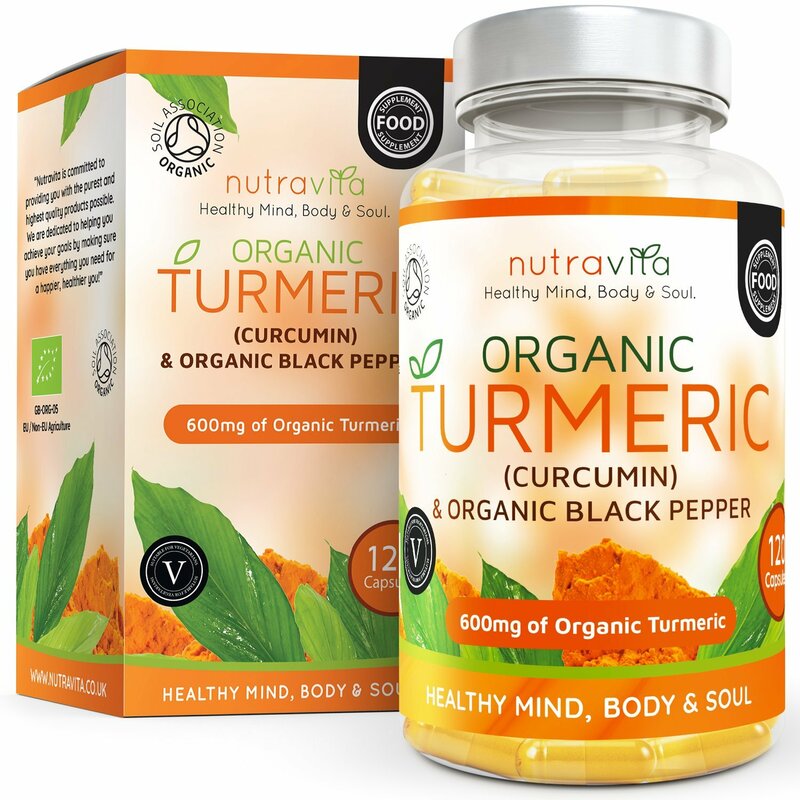 ✔ High Purity and High Potency - Nutravita's Organic Turmeric supplement contains 120 vegetarian capsules (6 month's supply at 1 capsule a day) of 600mg of high purity and high potency organic turmeric and 5 mg of black pepper. The addition of black pepper, which contains piperine, to our organic turmeric enhances turmeric absorption and bio-availability, helping you get the most benefit from our organic turmeric. Turmeric and curcumin are two amazing natural ingredients with a long list of health benefits associated with them. Hopefully, with the help of our guide and reviews on the best curcumin supplements you managed to find a supplement that is suitable for your needs. In our reviews we have included the products with high sales, excellent customer feedback and only those that contain the very best ingredients.